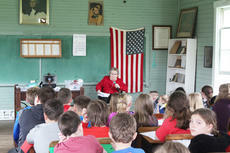 Jeanette Hall Jeffries gives Liberty Elementary School fourth graders a lesson about attending and teaching a one-room school at the Beech Bottom school, now located behind the tennis courts at Casey County High School. After more than 70 years, Jeanette Hall Jeffries once again sat at the head of the Beech Bottom one-room school and took questions from students. She taught at the school in the 1940s when it was a functioning part of Casey County’s school system. It is one of over 101 one-room or two-room schools that were in every community throughout the county. This time, she was the guest speaker April 8 in a program that the Casey County Retired Teachers organized to bring students to the school to learn about their heritage and how their grandparents were taught.